I'm that girl who keeps a stack of blankets in her trunk. I mean, you never know when the mood to hit the beach, watch some fireworks, have a picnic, or see a concert might strike—and I believe in being prepared. That's carried over from young adulthood to slightly-older adulthood. However, we're not always in my car when that happens. Or maybe we are and, as much as we love them, just don't feel like lugging out the big blankets. That's when this (why didn't I think of that) invention comes in handy. It's called Monkey Mat, which you may have seen on the show Shark Tank. Originally inspired by an unexpected six-hour layover at the airport and "constant cringing while two babies crawled all over dirty floors", this large mat is so portable that it can be taken anywhere. The mat itself measures 5' x 5', but the lightweight pouch attached pouch is small enough to fit inside your purse. 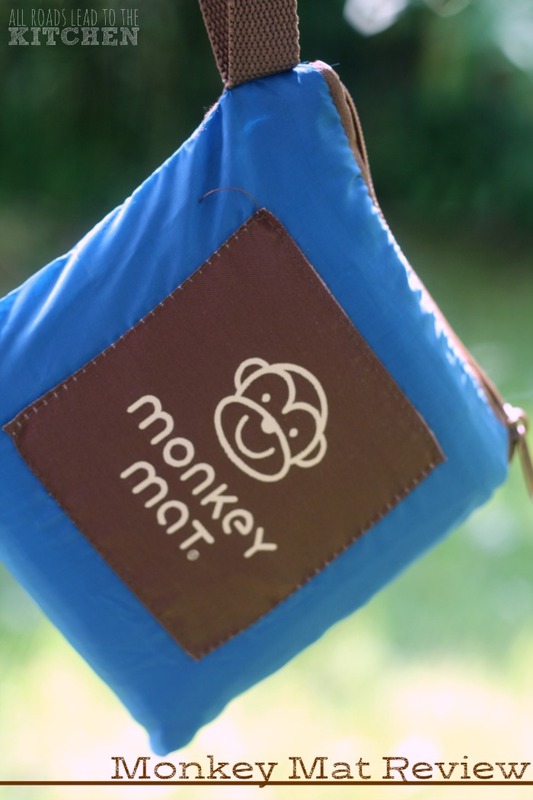 I was recently given the opportunity to try Monkey Mat for myself, and today I'm going to share my review. Use: Portable surface cover that's great for outdoor activities like picnics, fireworks shows, concerts, the beach. Also good for airports and other indoor spaces where you might want a clean surface for your kids to sit. Appearance: Comes in several different colors, allowing you to pick a shade that best suits you. 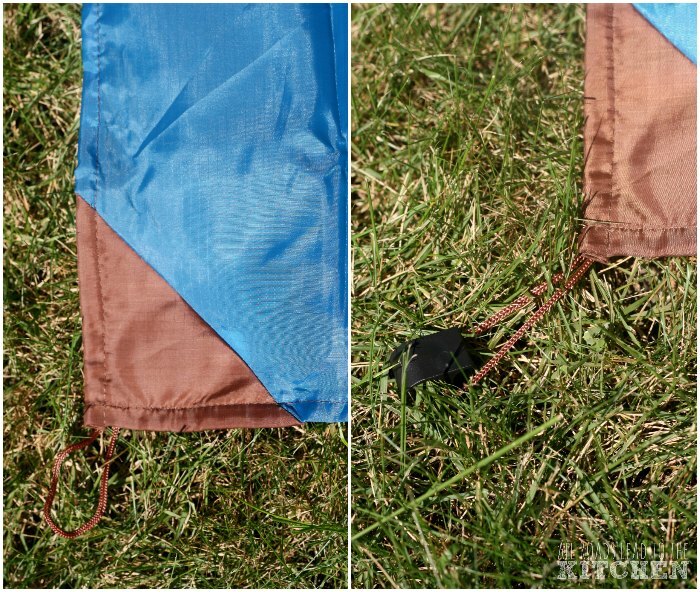 It has weighted corners with loops for using stakes (not included) if you need extra grounding. You can also use the loops to connect multiple mats together for a larger surface. It has a center "fun tab" that you can attach things to (keys, toys, leashes). Compact and lightweight at only 12 ounces, plus it has an attached pouch that it folds right into, making it very portable. Comes with either a strap or clip that attaches to strollers, bags, purses, leases, etc. Quality: I think it's great. Thin, but very durable since it's made from ripstop nylon. That being said, I wouldn't set it over sticks or rocks (as much for comfort as for keeping it intact). 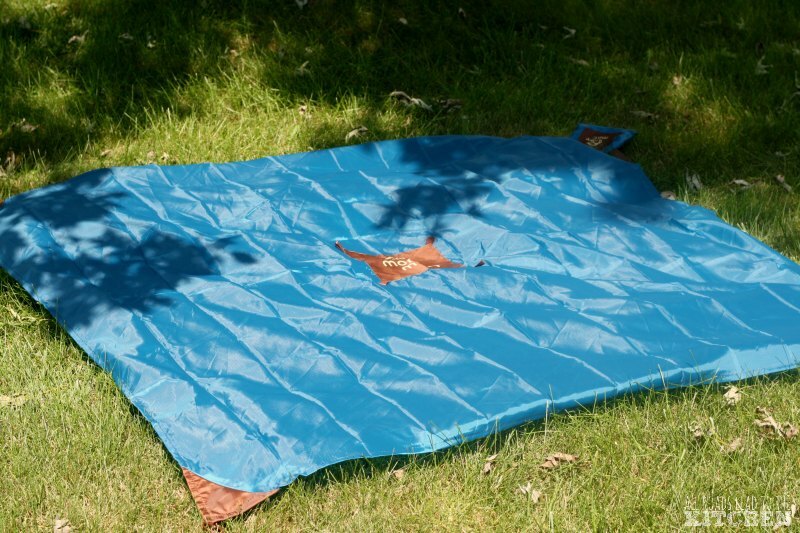 Size: The basic Monkey Mat measures 5' x 5', which seats a couple of adults comfortably, or a few kids. Since my kids are all pretty big now, I need to pick up a couple more Monkey Mats so that we can all sit together when we head to the beach or a fireworks show. I will probably buy the Mega Mat next, which is slightly larger. Would I purchase it with my own money: I would definitely spend my own money on this. I actually plan on buying several as gifts, starting with one for my oldest child who just went off to college this year. It'll be great for throwing in the car to use at concerts. 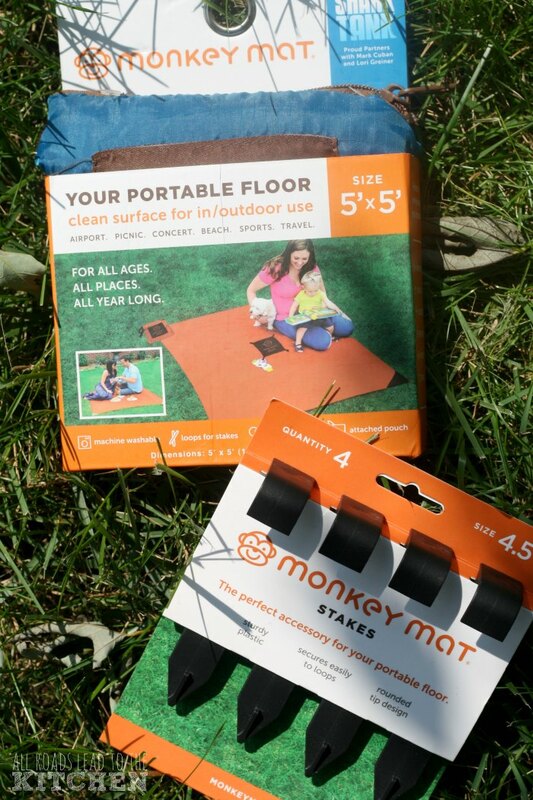 As a US Family Guide blogger I received a complimentary Monkey Mat for the purpose of review. All thoughts and opinions are my own.